There have been lots of little changes chez moi the past few months. All good, but blogging has taken a back seat for the duration. I am still cooking and hope to start showing off the results soon, but posting will be somewhat spotty for the near future. In the meantime, spring continues to strengthen its presence. Baby greens are springing up at the Green City Market, and I have been enjoying many a salad. 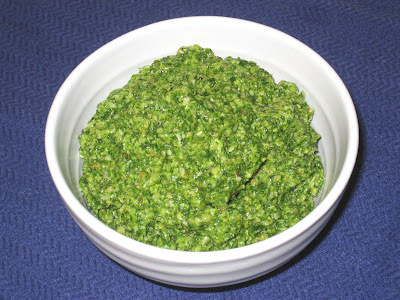 And this lovely arugula pesto. I bought a bag of arugula at the market and it was so fresh and beautiful I wanted to do something special with it. I haven't made pasta in a while so I decided a nice pesto was in order. I had the rest of the ingredients in the pantry so it came together quickly. In addition to serving it with pasta, I used it as a base for a salad dressing and as a topping for focaccia, all delicious. It would also nicely top roasted vegetables or potatoes. The recipe I used was slightly adapted from Elise Bauer's recipe on her site Simply Recipes. By slightly, I mean that I used a fourth of a cup of olive oil rather than the half cup called for in her recipe. Other than that, I followed it as it is written here. You should follow it, too. It's a quick, easy and delicious meal that can be prepared in the amount of time it takes to get the pasta water boiling. This weekend the market moves to its outdoor summer location on the south end of Lincoln Park. Color me excited!